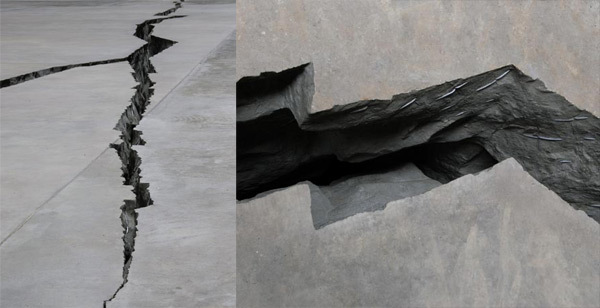 “Doris Salcedo’s Shibboleth is the first work to intervene directly in the fabric of the Turbine Hall. Rather than fill this iconic space with a conventional sculpture or installation, Salcedo has created a subterranean chasm that stretches the length of the Turbine Hall. The concrete walls of the crevice are ruptured by a steel mesh fence, creating a tension between these elements that resist yet depend on one another.” Love the images of this latest exhibit at the Tate Modern. Found this over at DesignBoom. There’s not a lot of info on Bleijh’s website, but from what I can gather, Basten Leijh is a Dutch product designer whose primary goal is to create user-driven products (some of which appear to be in concept phases at the moment). I love the simplicity of the work - clean lines and forms, with function given primary consideration (though the products don’t look so bad, either). I covet the Fruitbowl - my beef with so many similar products is that they take up so much space on my counter top when not in use. It would be great to compress the bowl when I’m done with it. I just spotted this incredibly cool shipping container/Illy cafe titled the “Push Button House” on The Cool Hunter ~ and it brought back a flood of memories, of all the other fascinating uses of shipping containers that have come up on NOTCOT in the past (full pictorial reminiscing below of more than 10 breathtaking reincarnations) from instant server black boxes to bars to art galleries and more. But check out how this Illy one opens! And how much they pack in there? Shade Elaine and i are thinking this might be the way to have the perfect mobile studio, and we can drop down in random backyards of friends all over the world? Hehe. Ok anyhow, i digress. “Holiday shoppers milling about the Time Warner Center in New York will have a fabulous chance to experience one of these soon. 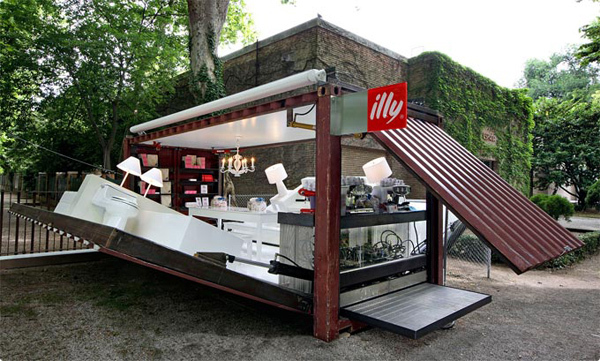 Between November 28 and December 29, 2007, they can rest, relax and sip a perfect cup of illy espresso in one of Kalkin’s creations, the temporary Push Button House cafe that the Trieste, Italy-based illycaffè will install there. The European premier of this concept by Alan Kalkin and illy took place at the 52nd Venice Biennale where illy continues to partner with the Fondazione La Biennale di Venezia by providing the visitors each year a space to relax and enjoy their complimentary espresso.” Adam Kalkin has an impressive portfolio of living/lounging spaces created from shipping containers as well ~ more images of those as well as an animation of the Push Button House opening below! Magic Symbols ~ its like a secret code through silver and string - and a card. “Once it is unwrapped to its full length of almost 4 feet (46” to be precise, or 120 cm), the meaning disappears and your secret love affair would never be recognizable in public as it turns into a multi-layered necklace. Only when you wrap it around the card, does the true meaning shows up.” And that true meaning can be a heart, skull, or infinity symbol ~ seems like a brilliantly simple gesture, and also something easily replicable for the craftier kids in the group. Currently the soup du jour at Charles and Marie. Re-Bag is an exhibition of Limited Edition Reusable Canvas Bags designed by 15 leading UK designers running from Oct 5-11 at the Sea Gallery in London. 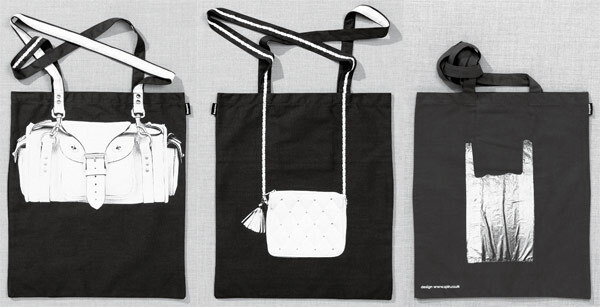 “Designers responded to a brief to create an image for a bag on the theme of sustainability and reusability. The resulting bags not only promote this idea but are also in themselves an ecologically friendly alternative to the use of non-green materials in everyday packaging.” Now, i’m sure by now you all know i have quite a soft spot for bags, in fact the whole team here does… and perhaps its less a soft spot and more of an obsession. BUT, that being said, i must tell you that i’m getting quite tired of all of these reusable bags that are specific to grocery shopping, etc… as if you really need yet another bag (other than the many in your closet which could probably hold groceries just as well)… as your dedicated grocery shopping bag? Anyhow, the “I’m not a plastic bag” atrocity has gotten far too much attention, and then every quick packing lightweight plastic grocery bag alternative… but now the need to collect and purchase even MORE bags? Doesn’t it seem a bit ironic that we’re still over consuming? BUT that doesn’t keep me from wanting some of these… very fun to see how designers took on the brief and created some really fun unexpected designs. Love the two sided purse images on that bag above… and the one below with the images of “Return. Power. Shift. Control” keys is quite cute as well. All bags are screenprinted white onto dark grey canvas (440mm X 387mm) and are produced in a limited edition of 250 of each design and a mere 15 pounds each. via Serif. Click images to see more! Ah, another round of black and white goodness at NotCouture. Truth is we don’t try to filter for the black and whites, in fact i think we may all just be drawn to them. And they do end up looking gorgeous together floating on the page. Weeks ago I ordered the Paperclip desk by Blu Dot. It has everything I want.. simple and clean design, that plywood and steel wire aesthetic, and a keyboard tray. I finally received the desk and well… I wish this post could be about me enthusiastically gushing about the desk, but sadly it’s not. And before I go any further, I just want to say that this is not something we really do on NOTCOT. As you know by now, we’re all about talking about the things we love. But it didn’t sit well with us that we had given Blu Dot’s Bonnie and Clyde sofa such a nice posting, and yet I have this pretty terrible experience with their desk… or rather, their packing methods. So I just have to share. You know the drill, click the pics to see more! Munchies? I’ve been getting in this terrible habit of finding myself at TasteSpotting when i get late night snack cravings… so instead of indulging tonight, just rounding up some of the fun enticing food options! Sweet dreams. On the latest in designer collaborations, Issey Miyake and Dyson have teamed up at the Paris fashion shows to showcase their Spring/Summer 2008 on the theme of “The Wind”. A narrative inspired by the magnificence of wind led us to a collaboration with James Dyson; the design engineer who harnessed the power of air and invented cyclone technology for vacuum cleaners. Dyson gave the world a vacuum cleaner that overturned the prevailing wisdom, taking 15 years to perfect. The truly innovative quality of the product and its design engineering excellence have particular resonance for ISSEY MIYAKE. We are honored to have James Dyson manage the stage set for the Paris Collection show, where he will generate wind on the runway. As well as creating garments inspired by a variety of wind forms, the ISSEY MIYAKE team dismantled the vacuum cleaner developed by Dyson and analyzed its construction in the search for fresh perspectives on shaping new garments that expand the realm of possibilities for wind and clothing to co-exist. And some of my favorite screenshots are below! 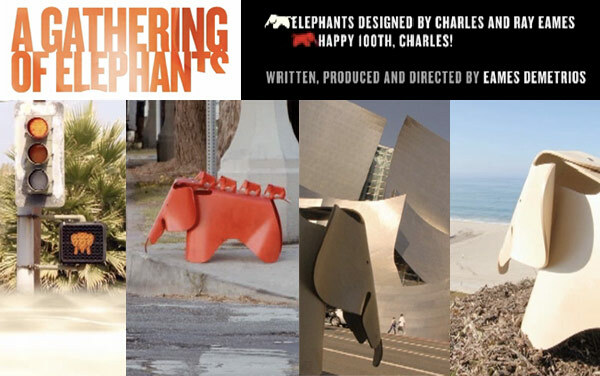 And i love that it is shot all over LA ~ lots of LA icons from randy’s donuts, the gehry music hall, santa monica pier and looking down at PCH, the tar pits…. ahhhh, home. And its great they even went guerrilla street art on the crossing signals to make them elephants! As you might know, Sean and I got married in September. Sean bought my engagement ring from this amazing Japanese jeweler, Niwaka, and we loved the ring so much that we decided to get our wedding bands from them, too. Niwaka’s designs are (mostly) very simple and elegant, with clean lines and a twist on the traditional ring setting. 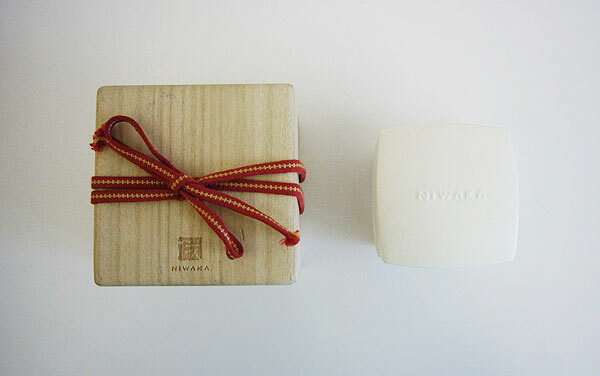 Niwaka pays close attention to detail, and that extends to their packaging, as well. The rings sit in a two-piece, white ceramic box (it looks like a tooth in profile! ), which comes packaged itself in a simple wooden box. A red ribbon ties the box together. So that the wooden box sits flat, two holes are cut into the bottom of two side faces to allow the ribbon to run concealed along the inside of the box. Niwaka has stores in Kyoto and New York. You can see more ring designs on their website. I was just going through my images from Philly and i love the way this one turned out… click it to see it larger. Bahdeebahdu. 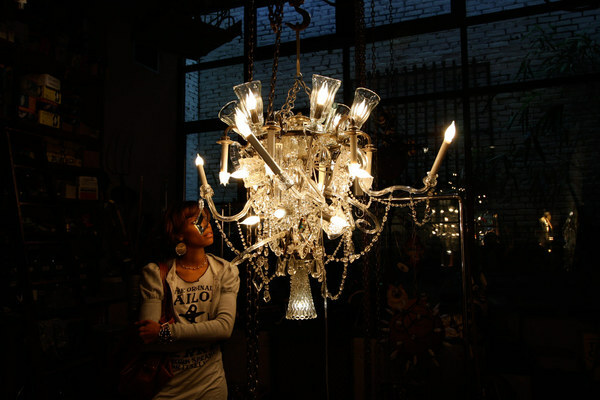 Let’s skip the story of the naming and jump right to the studio… basically this philly studio produces some fascinating lighting pieces out of any/everything you can imagine. The one piece that grabbed me was a work in progress in the workshop in the back (see the images below of how incredibly organized all the found glass is filling the walls of the work space) ~ above you see a chandelier that has been commissioned to hang over a smaller dining room, and it actually began as the original chandelier, only flipped upside down, and now everything from milkshake glasses, dishware, etc are being added on one piece at a time. And the result is a breathtaking array of light. 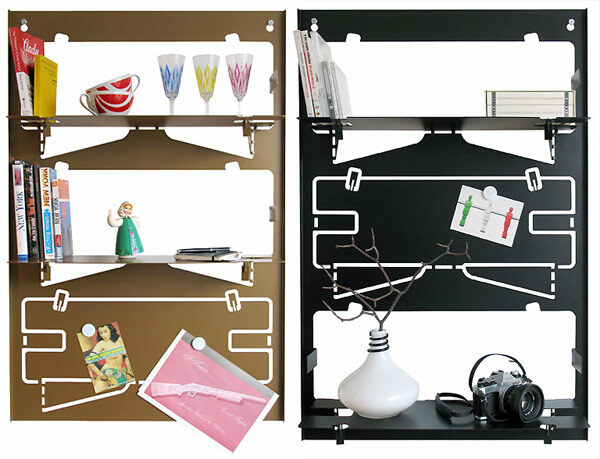 Piegato by MRDO Products is the bookshelf both my future studio and past dorm room need. As a “sheet steel rack with a surprisingly high load capacity, this laser cut and powder coated sheet steel” has been kept as simple as possible, allowing for YOU to choose which you use as shelves and which as magnetic boards. All you need are two screws to hold it up - it bends easily by hand - and comes in one flat sheet! It weighs in at a light 8kg, and is 100cm x 66cm x 2cm. Comes in black, white, and gold. I even love that they have a little video of it from unboxing to filling the shelves. We’ve seen quite a few sheet steel bending products coming through, but so far this one is the first i actually would love a few of.